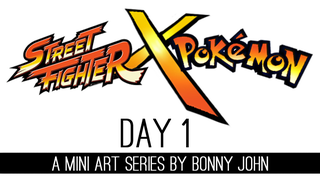 SF x PKMN Day 1! Ryu x Lucario! One year ago today, I posted a little picture of Bulbasaur and started a series called Pokemon One a Day. I had no idea how long I could continue a project that I started in a forum for the website I lurked the most...I was nervous but also anxious. Kotaku was and still is at the top of my blog-roll, and I figured I could share my art with gamers who might appreciate such a ridiculous idea...and you guys all welcomed me and the art with open arms. I was scared of feedback and how the work and myself would be received and all of that soon quickly alleviated. One year later, I've made tons of friends and my art and skills has reached further than they ever have before. One a Day was a huge hit, and I can't believe that all of that actually went down! That said, let's get to something new and start this one year anniversary right! I know, and I'm sorry for the lack of variety! The thing is, I actually had this series planned last year before One a Day was ever even conceived! Street Fighter was more of the focus, as that was the game I always play with friends, and I saw Kotaku post some fan art of Legend of Zelda x Pokemon and I felt I had to do this in my style. Read in the comments below some more details about how all this came to be. I'm picking off from concepts that began over a year ago...Without further delay, let's begin! 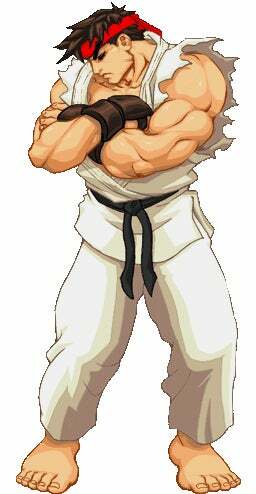 Ryu and Ken were raised under Gouken, learning the ways of Shotokan karate. The two became best friends, and soon their bonds evolved into brotherhood. When Gouken realized the boys were advancing past their intended level of training, he introduced to them a challenge of raising their own student while still under his supervision. Ryu sought to capture a Pokemon by the dojo, knowing that the forest that enclosed their training grounds were home to all sorts of interesting creatures. One day, as he was meditating along the river banks, a most curious Riolu found Ryu and a sack containing fruits that he had brought to eat in between training. The Riolu mistook the meditating Ryu to be asleep and was caught stealing the martial artist's food. Rather than scolding the Pokemon, Ryu let the creature take the food and go on it's way. Ryu left the forest holding the empty sack and laughed about the incident to return home to Ken who had purchased his Pokemon partner from a village nearby. Unimpressed, Ryu had expected Ken to pull out coin to complete his challenge but didn't think he'd actually go through with it. The next day, Ryu felt more anxious than ever to complete his challenge and find a Pokemon partner. He returned to the spot hoping he could catch the Riolu using the sack to lure in the young creature. Ryu closed his eyes, placing the sack of food next to him. Peeking out of one eye, Ryu looked around for the creature. He closed his eyes for a few moments when he heard a crack. Ryu opened his eyes and looked around and saw no sign of the Riolu. Once more, Ryu closed his eyes. 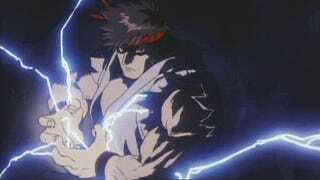 Moments passed, and Ryu's thought to capture the Pokemon escaped his mind as he began to fall into a meditative state. Eventually, he awoke from the trance to find none other than Riolu seated right next to him! Even more interesting was the fact that he was in his own meditative stance, legs crossed and all like he! Riolu, a creature that was sensitive to aura, picked up the good vibes of the hado in Ryu and must have felt compelled to join the human in the activity. Ryu gave the creature the food in the sack and promised to come back the next day. Riolu would soon await Ryu's arrival to the same spot every day, after which for some time he began to mimic Ryu and all that he would do for his training. Riolu eventually learned all of Ryu's stances and forms, and would meditate at the end of training with his friend. After many meetings, Riolu decided to follow Ryu home, at which point a student and master relationship was formed, and Ryu could say he finally captured a partner and friend for Gouken's challenge. Lucario has been Ryu's partner for a long time. The two have bonded to the highest possible level, and to this day follow the same routine in training. Lucario has picked up Ryu's traits and personality down to the wire except at times he can be overly stern and serious. Other than that, he is calm, reserved and works tirelessly to keep up to his master's level. Ryu, Lucario, Ken and his partner have grown greatly since their initial challenge was issued and met. The four constantly spar, in doubles, of course. Ryu and Ken's intense but friendly rivalry carry onto Lucario and his friend, although Lucario takes even light practice and sparring too seriously. Lucario's only problem with Ryu is that he doesn't understand why Ryu doesn't go all out in the sparring matches with Ken. Story time over! But wait, there's more?! Of course there's more, you should know me by now and how much I enjoy writing these things! Okay, so let's get the health bar and special meter bars out of the way. Like I said yesterday, I'm not much of a UI designer, but I think I got some solid bars down. Actually, that sounds like I'm a rapper or something. But anyway, I tried to combine SF x Pokemon visually in there. I'm definitely open to fixing it up depending on what you guys think. The Street Fighter elements on the bars is the paint splatters that were made prevalent in the SF4 trailers and in game effects. The special bar is lifted from SF4 in that there are 4 bars that equal one full meter. The way I imagine it is that the meter rises when you dish and take damage, like the original, but it's also slowly rising on its own. Those with mega evolution ultimates will have the mega symbol in the circle of the meter and have the bar rainbow colored. I envision the bar to be shifting colors very softly, and when it's full, the mega evolution symbol will began to twirl and start glowing aggressively, suggesting it is ready to be utilized. On to the health bar! As I said before, the paint represents SF, so I had to figure out a way to represent Pokemon. Well, since the two have their own health bars, I decided to fuse the two into one sort of bar. Lucario's name is written out in a Pokemon font, but is against the white background split from the red by black. This actually creates the color of the Pokeball, which is also right there to connect the two bars as a fastener of sorts. The green HP from Pokemon is back, which was actually accompanied by "100/100" and would give you the numerical data of HP like in the games but cut from the sleekness of the bar. There's also an added arrow that juts from the side which again is lifted from the games that points to the Pokemon which I think is a small but nice tough. The coloring of Ryu's bar is a general take on many bars in the fighting game genre, but also sits nicely against green. Oh, and as for that Pokeball up there - I imagine it'd go dim when the Pokemon faints. Oh, and it should be made obvious that in this fake game, Ryu can only fight Ken and not his Pokemon, and same with Lucario fighting his rival rather than Ken. That said, I envision the Pokemon fight first – whoever falls first gives up the round, and then the trainers come to fight one another. If you win both matches, you win a set. First to two sets wins and would be the default set up. Lucario was the best possible choice for Ryu, in my opinion. I mean, I think it's an understatement really. 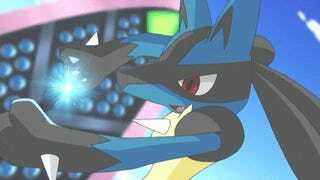 Lucario is a Steel/Fighting type, the two very types that embody Ryu to the fullest extent. The fighting type is sort of self-explanatory, but steel represents Ryu's iron will and and never faltering nature. Then you've got the fact that Lucario uses aura to fight and shoot projectiles…Kinda sounds like Hado and Hadouken, right? And what's more is they both fire blue energy balls. Cray-cray! When it came to giving a pose to the two, I had gotten Lucario's right off the bat and was so very excited to implement it. In case you can't tell, Lucario is mimicking Ryu's iconic victory pose where he looks down, eyes closed, arms folded with his bandana blowing in the wind. It was clutch that Lucario has a band across his face and ears that look like the trailing bandana of his master. Ryu is given a pose that you might expect him to make before any fight – getting prepped and ready to go. The general direction for this mini series is that all the duo portraits are pre-battle positions, like when the announcer is getting you set for the battle…Go for broke…Fight!!! Oh, and lastly, the grass! I originally left it very simple and boring with shadows, but then I thought of spicing it up by paying homage to the older Pokemon games that began to add elements of scenery into the battle. I think it works well here, and grounds the two nicely. I added an outline to further connect the two different franchises and went with something more cartoony I suppose, despite the level of detail in the wrinkles of Ryu's gi. I think it meshes well – what do you think? Thanks guys for your time! Next one will be a lot shorter, as introductions are now out of the way. Thanks for having me for a year, and I hope you'll come to enjoy this little mini series.